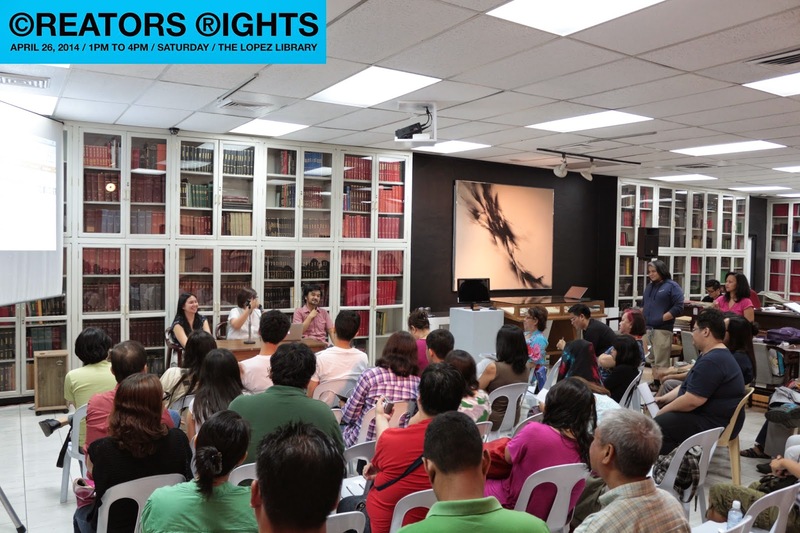 On the heels of World Book and Copyright Day: CREATORS RIGHT / FORUM on WRITER’S RIGHT were held on 26 April, 1-4 pm. Organizer’s Event Post: Intended to be a sobering threshing-out of the fundamentals of Creators Rights, what they are, how they are practiced today, and how they should be practiced in the future. Natural rights and negotiable rights will be discussed. A sample contract will be shown and dissected, its terms problematized: shared copyright, work-for-hire, royalties, right of first refusal, ownership of originals, derivative work, copyright infringement, fair use, et al. The construction of a baseline contract that is fair to all parties concerned will be attempted, as a template that could be used for future negotiations. Time permitting, we will also try to discuss the new BIR ruling regarding freelancers registering themselves as self-employed tax payers, and the requirement to issue official receipts to clients – its purpose, and the processes involved. The main speakers are author Beverly Siy, columnist and publisher Katrina Stuart Santiago, book blogger and publisher Honeylein de Peralta, and author and publisher Mina Esguerra. It is open to all writers, artists, designers, musicians – practically anybody whose art practice intersects with the legal games of corporations; in short: it is open to everybody. Lopez Museum and Library invites writers and aspiring writers (as well as designers, and musicians) to Writer’s Rights, a forum on their natural and negotiable rights and how these can be practiced and upheld today and in the future. The forum will be held on April 26 from 1 – 4 p.m. at the Lopez Museum and Library. Topics that will be discussed include drafting of a contract for freelancers and aspects such as shared copyright, work-for-hire, royalties, right of first refusal, ownership of originals, derivative work, copyright infringement, fair use, etc. Bureau of Internal Revenue’s new rule regarding freelancers registering themselves as self-employed tax payers, and the requirement to issue official receipts to clients will also be tackled. Main speakers are author Beverly Siy, columnist and publisher Katrina Stuart Santiago, book blogger and publisher Honeylein de Peralta, and author and publisher Mina Esguerra. The forum, offered FREE of charge, is part of the Lopez Museum & Library and BLTX’s public service program for the creative industry and is supported in part by Gourmet Farms, Inc.
For more info call Tina at 6312417. The Lopez Museum and Library is at the ground floor, Benpres Building, Exchange Road corner Meralco Avenue, Pasig City. Museum days and hours are Mondays-Saturdays, 8 a.m. – 5 p.m., except holidays.